The Oscar nominations were just announced this morning and the Sundance previews are starting to arrive, but we’ve got some even bigger news to drop on the world today… that’s right, it’s time to announce the winner and runner-up in HTN’s Winter ’15 Short Film Contest! Speaking of Sundance, it just so happens that all of our judges this go ‘round are playing very vital roles at this year’s fest: filmmaker judge Sean Baker will be premiering his latest feature, Tangerine, in the festival’s beloved NEXT Section; industry judge John Von Thaden will be scouring the program for possible Magnolia Pictures-approved titles; and, perhaps most sweetly, Brian Bolster will be presenting his HTN Summer ’14 Short Film Contest winner, One Year Lease, in Documentary Shorts Program 1. How cool is that?! We must also give a deep thank you to our participating festivals this go ‘round: LA Film Fest, IFFBoston, Maryland Film Festival, Nashville Film Festival, Riverrun International Film Festival, Montclair Film Festival, Sarasota Film Festival, Hamptons International Film Festival, Oak Cliff Film Fest, Sidewalk Film Festival, St. Cloud Film Fest. To remind you, this means that the winner and runner-up receive fee waivers to all eleven of these awesome fests. Lastly, and the opposite of leastly, we are most deeply indebted to the filmmakers who busted their butts to make their movies and busted their wallets to submit them to our contest. I say it every time in this post, but I’m here to say it again: By submitting to the HTN Short Film Contest, you are keeping this site alive and supporting ambitious indie cinema so thank you-thank you-thank you! Let’s start this off with a quote from judge John Von Thaden: “This fired on all cylinders, great lead performance and filmmaking.” While John is right about both of those things—our 2014 Silver Nail winner Sean Price Williams strikes yet again with his cinematographic skills (seriously, this guy is getting ridiculous)—it is without question the lead performance by Tallie Medel that sends Bruce Smolanoff’s blackly comic drama into the stratosphere. 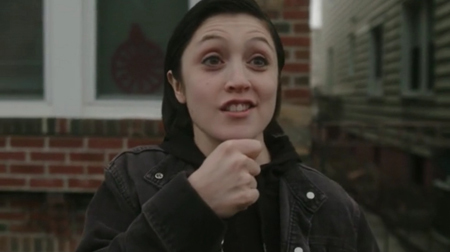 Many of us have been convinced of Medel’s talent from her indelible performances in Dan Sallitt’s The Unspeakable Act and Caleb Johnson’s Joy Kevin, but in this portrait of an aspiring Brooklyn standup, she widens her range even further. If movies like Frownland and Bad Fever are up your gritty alley, you’ve parked your hooptie in the right place!